A capo is essentially a special clamp that attaches to the neck of the guitar, and presses down all the strings at once. Remember that when you press down any note on the guitar, and then move up to the next fret, and then up to the next fret, the note gets progressively higher in pitch. When you clamp down all the strings at once, the same thing happens, right across the board. All of the clamped down notes are raised at once. If you then act as if the capo is the 'new nut' and make chord shapes as though the capo is the beginning of the guitar neck, the chords will work together in the same way they do without the capo. The important difference is that the entire chord will sound higher in pitch. The main reason for doing this at this juncture in the course, is to raise the pitch of a song so that it is in a better place to accommodate your singing voice. 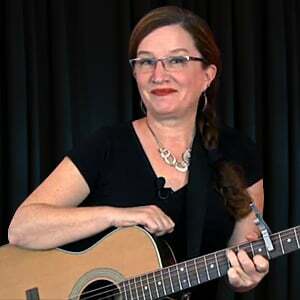 Keep in mind, if you do use the capo to adjust the pitch of the song to accommodate your singing voice, you will no longer be in sync with me and the videos. You should practice all the songs along with me and the videos without using the capo. It is only when you decide to learn to play the song on your own that the capo may help you tailor it more precisely it to your own voice.